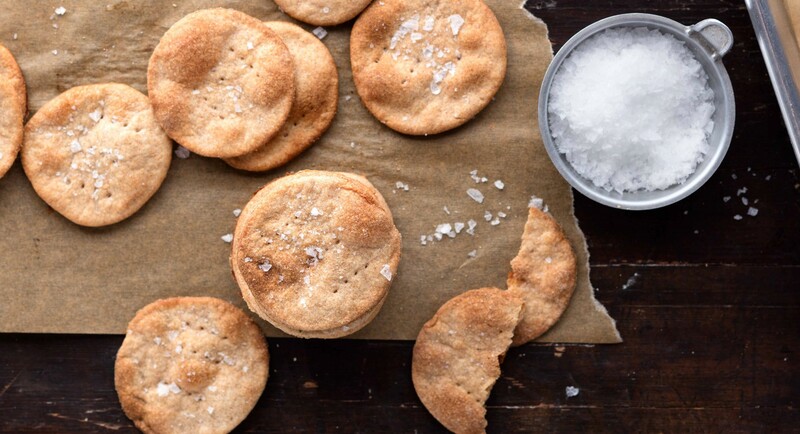 If you're new to baking with sprouted flours, this simple recipe for pita-like crackers is a great place to start. Yogurt adds a delicious tanginess to nutty spelt flour, and letting the dough rest for a few hours before baking really allows the flavors to develop. Once you've mastered the basic version, try mixing fresh herbs like thyme, tarragon, or chives into the dough with the butter. Combine spelt flour, sea salt, and yogurt in the bowl of a stand mixer fitted with the dough hook attachment. Mix on medium speed until dough forms a smooth ball. Cover bowl with a tea cloth and let sit at room temperature for 2 to 8 hours. Preheat oven to 450 degrees and line two baking sheets with parchment paper. Knead softened butter into dough until well combined. Remove dough from stand mixture and divide into four equal parts. On a lightly floured work surface, roll out dough to 1/8-inch thick. Use a biscuit cutter to cut dough into 3-inch rounds (or use a sharp knife to create triangles or any other shape). Transfer crackers to baking sheet, brush tops with melted butter, and prick with a fork to prevent puffing. Sprinkle with large-flake sea salt and bake until golden brown and crispy, about 7 minutes. Store in an airtight container.